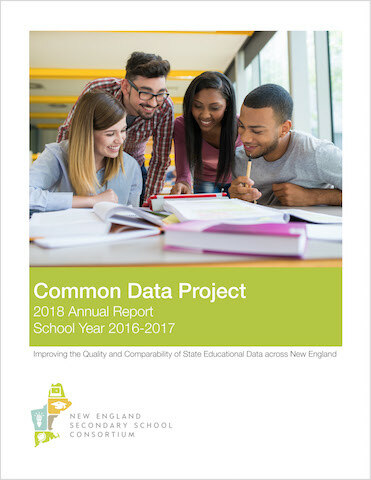 The NESSC Common Data Project Annual Report provides transparent, comparable data about high school and college outcomes from the six New England states. We began tracking high school graduation and dropout rates in 2009. Since then, extended high school graduation rates have been added as well as college enrollment, persistence, and completion measures. Disaggregating the data by student characteristics across all six indicators allows us to examine educational equity in New England secondary school outcomes by economic disadvantage (ED), English learner status (EL), disability status, gender, and now race/ethnicity. In 2009, the state education agencies participating in the New England Secondary Consortium (NESSC) began collecting, calculating, and reporting data on key indicators using consistent procedures. To promote more accurate and reliable data comparability across member states, the NESSC Common Data Project develops and implements standardized procedures designed to minimize variance that may result from divergent data systems or computational errors. The Common Data Project also employs additional quality control mechanisms that further improve the reliability and comparability of state-reported data. To our knowledge, the NESSC Common Data Project is the first initiative of its kind in the United States. Data specialists from the participating SEAs, along with representatives from higher education and other data experts, meet throughout the year to discuss best practices, refine agreements, and coordinate the collection and reporting of data. Several refinements of in-state data procedures have resulted from lessons learned from other states. The six states use common metrics, procedures, and rules when compiling, calculating, and reporting data. A full description of these procedures can be found in the Common Data Project 2018 Procedural Guidebook. The common data procedures and metrics are compliant with all state and federal rules, regulations, and guidance related to data quality and reporting. The common procedures and rules are published under a Creative Commons license, which allows for the free use of all content, and other SEAs and educational organizations are encouraged to use and adapt our work. Each year, the Consortium produces a comprehensive report on graduation rates, dropout rates, and postsecondary enrollments and persistence rates for each of the five states. The Consortium, and its participating SEAs and partners, use these annual reports to help evaluate the impact of state policies and initiatives designed to improve secondary schools and student performance. Each year, the five SEAs publish the Consortium metrics on their websites, making the data available to the educators, policymakers, and the public. Common Metrics: The Common Data Project has produced a set of common formulas that are used to calculate secondary graduation rates, secondary dropout rates, and postsecondary-enrollment, -persistence, and -completion rates. Common rules: All participating departments of education follow the same “business rules” and procedures when collecting, calculating, and reporting common data to improve consistency, comparability, and quality. Common definitions: Each variable in the common regional data set is determined using consistently applied definitions. For example, all five departments of education follow the same definitions for economically disadvantaged students, English-language learners, students with disabilities, and other student subgroups. Common reporting windows: All five departments of education follow common data-collection and data-reporting timelines. Since most large-scale databases are continually updated, common reporting windows improve the consistency and comparability of multistate data sets. Common quality-control procedures: The Common Data Project uses both internal (state-by-state controls) and external (third-party coordination and auditing) as part of its common quality-control framework. The redundant, multistage protocol is designed to improve data quality throughout the collection, calculation, and reporting cycle.